We never cease to be humbled by those we serve who persevere in the face of difficulties and discrimination. Mahinder Singh’s life has been fraught with hardship. His troubles began in 1947, when Britain — which had occupied the Indian subcontinent for generations — divided its colony into India and Pakistan, causing a migration of people considered the most extensive in recorded history. Major riots flared among Hindus, Muslims and Sikhs. The ensuing violence killed roughly a million people, including Mr. Singh’s son and many of his relatives. Born more than 90 years ago to a Sikh family of farmers in the Okara district of present-day Pakistan, Mr. Singh became one of the estimated 14.5 million people forced to abandon their ancestral homes and cross the new border after the partition. Complicating matters further, Mr. Singh is a Dalit. A Sanskrit term, Dalit denotes the former “untouchable” groups in India’s multilayered caste system that segregates people on the basis of their birth. According to the 2011 national census, one in six Indians belong to this caste; in Uttar Pradesh, now home to Mahinder Singh, some 20 percent of the state’s nearly 200 million people belong to this group. And though Mahatma Gandhi called the Dalits “harijan” (children of God) and the Indian constitution bans caste discrimination, those once identified as such continue to lag behind, socially and economically. The Indian government recognizes and protects Dalits, but Mr. Singh cannot claim any benefits; his community, Rai Sikh, is not listed as a scheduled caste in Uttar Pradesh. Nor may Mr. Singh appeal this status, as the special concessions for those of low-caste origin are restricted only to Dalits who identify as Hindus, Buddhists or Sikhs. Dalit Christians and Muslims are excluded from any concessions under the pretext that Christianity and Islam do not recognize the caste system. For the past 65 years, churches have been fighting to redress this injustice, saying it violates the Indian constitution’s prohibition of discrimination based on religion, caste or gender. But Mr. Singh is not alone. He belongs to a community of hundreds of Syro-Malabar Dalits united within the Syro-Malabar Catholic Eparchy of Bijnor, which includes Uttarakhand state and the Bijnor district of Uttar Pradesh. ...Theirs is a story of both purpose and perseverance. Despite tremendous obstacles, the parish community has managed to thrive, buoyed by a fervent and unshakable faith. You can read more about Mr. Singh’s witness in Caste Aside from the Summer 2014 edition of ONE magazine. For decades, CNEWA has worked to improve the quality of life for Dalits throughout India. Want to help us help them? Take a moment to visit this link. Young men play basketball at the Mai-Aini refugee camp in Ethiopia, home to more than 17,000 Eritrean refugees. 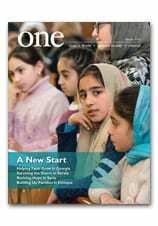 To learn more about the camp, and the dreams of those who have settled there, read Starting Over from the Summer 2014 edition of ONE. Father Sunny Mathew delivers a homily in Most Holy Trinity Church in Yonkers, New York. Read on to learn more about his parish and this particular branch of the Catholic family tree. And check out the video below, in which we pay a visit to his parish and experience the liturgy. Sister Amal was drinking tea at the Good Shepherd Convent in the Egyptian port city of Suez when the first stone came through the window. It had been a chaotic year. For months, massive protests against President Muhammad Morsi and his Muslim Brotherhood had rocked the country. By late June the protests, which had gained the public support of Christian leaders, culminated in the military’s forced removal of the Islamist president. In the eyes of some Egyptians, especially those who supported Mr. Morsi, an alliance had been forged between the military and Egypt’s Coptic Christians. (Ethnic Egyptian Christians are known as Copts, derived from the Greek “Aigyptos,” meaning Egyptian.) This was affirmed further by the interim government’s subsequent brutal crackdown of Islamists throughout Egypt. Picking up the shattered glass, Good Shepherd Sister Amal was unaware that earlier that same day, 14 August 2013, the interim government had used lethal force to end two massive sit-ins, resulting in more than 600 deaths. In retribution for the alleged alliance, supporters of the ousted president stormed churches and Christian institutions across the country. A mob of possibly hundreds attacked the chapel near the convent. Sister Amal and her team rushed about, attempting to save as much as they could from both the sanctuary and the structure. Frantically, they turned off the gas and electricity, and eventually found a way to extinguish some of the flames. But as they worked, arsonists set fires elsewhere. Looters helped themselves to furniture, electronics and money. The flames proved too much to fight. In the chaos, Sister Amal ushered the workers out a rear exit. The police and army were nowhere to be seen. The mob had already killed one soldier operating an armored personnel carrier outside the chapel. Another fled. No one else came to help. On the final Friday of November, Sister Amal dreamed she had asked for a candle, but instead a friend named Raheb, who had helped her put out the flames all night long after the August 2013 attack, brought her the Virgin Mary wrapped in blankets. “At the end of the next day I told Sister Mariam the dream. She told me, ‘God willing, the Virgin will come in a flash, but I have to tell you some bad news.’ ” Sister Mariam told her the military had withdrawn from the area. They were once again without any protection. Protests were taking shape intermittently, and looters were still entering the chapel, which was open to the street. Anyone could walk in or out of the grounds. The sisters did not wait for help and have not forgotten what they have been through. As Sister Amal tells her story, she drinks out of the same teacup she held when the first stone came in the window. And sitting in the chapel, next to a statue of the Virgin Mary, is that very first stone. Read more about Sister Amal in Out of the Ashes in the Spring 2015 edition of ONE. And learn how you can help Egyptian Christians rebuild here. A little girl picks out a pumpkin in the village of Horpyn in Ukraine. Read about the ethnic and religious patchwork of the region in this article from the March 2009 issue of ONE. An Iraqi Christian soldier wearing a rosary stands inside the badly damaged Church of the Immaculate Conception on 2 November in Qaraqosh, near Mosul. The responsibilities entrusted to him are great: caring for about 50 shrines, more than two dozen parishes, various schools and other services provided by more than 250 Franciscan friars stationed at some of the most embattled places in the Middle East. But Franciscan Rev. Francesco Patton seems almost serene about the mission and his new post as the custos of the Franciscans of the Holy Land. In almost any other religious order, he’d be called a provincial or a superior, but because the founder of the Franciscans didn’t like terms that would denote superiority of one brother over another, he is called the custos, Latin for custodian, of the Holy Land Franciscans. Pastoral vocabulary is familiar and dear to Father Patton, whose father tended the fields of northern Italy. He said he feels comfortable and grounded in his farming community roots. As custos, he said, his duty is to take care of the friars, and particularly to assume primary trust of places important to Christians in the Holy Land, including shrines in Galilee, Bethlehem, Emmaus and Jericho, as well holy places in Jordan and Syria. It is a challenging post to be in, to be sure, especially because some of those places find themselves in political conflict, violence or outright war. Before the recent conflict broke out in 2001, Christian pilgrims would visit locales such as the Memorial of St. Paul, the place where he converted to Christianity, and the house were Ananias baptized him. Both places are in or near Damascus, Syria, and are under the care of the Holy Land Franciscans there. “Now these are places in which local Christians are praying and asking for the end of this war,” Father Patton said. Since the pilgrims are gone, they are places the friars use to provide shelter for those running from the daily conflict in other parts of the country. The guest house close to the memorial of St. Paul, where pilgrims used to stay, is now hosting refugees, he said. And the friars, even under danger, are providing food and any necessities to anyone who might need help. Recently, the friars launched a campaign at myfranciscan.org/syria, which includes a video and social media component, using the hashtag #Syriafriars, asking for prayers as well as material help for the Franciscans trying to assist the local populations. “We help everybody,” said Father Patton in an interview with Catholic News Service 3 November in Washington, where he was visiting in early November trying to call attention to the dire situation in Syria. “We don’t ask what is your religion when we help someone because we recognize in every person a living image of God and of Jesus who’s asking to be welcomed,” he said. Friars and nuns find themselves in desperate situations trying to help burgeoning populations such as Lattakiah, near the Mediterranean, where parish populations have doubled, as people run from conflict zones to areas of relative safety. The conflict has drained once Christian strongholds such as Aleppo. Aleppo was once a very important city and known as the “second cradle” of Christianity, said Father Patton, who recalls it had a Christian population anywhere from 250,000 to 300,000. These days, estimates say it could be down to 40,000 or 30,000 Christians, he said. Most have fled in the past five years, but many also have died there. “Now there are unfortunately many funerals, also of children,” he said. For the Christians who remain there, he said, it’s important that other Christians know of their suffering. It’s important to know what’s happening to them, to pray for them but also to act, Father Patton said. The friars are helping the local communities with food, electricity, water, gas, diesel, restoring houses after bombardments. “We need support,” he said. Yet for all the abundance of misery, there also is abundance of hope, not just in Syria but also in the Holy Land, said Father Patton. There are countless stories in the region of collaborations among Jewish, Christians and Muslim teachers and students and their families, he said. And the Franciscans are involved in trying to build the bridges necessary to one day have lasting peace in the region, he said, and it starts with children. When children learn to live together and become friends with people who hold different beliefs, their families, too, learn to hold different views, he said. Father Patton sees this type of peacebuilding as some of the most important type of work in the world. He talks about the recent visit of Pope Francis to Sweden and the example in peacebuilding that he is setting. The Franciscans, following his lead, also have been involved in interreligious dialogue and cooperation. Franciscan friars are involved in interreligious dialogue with Jews and Muslims and other similar initiatives involving youth in the area, he said. Cardinal Vincent Nichols of Westminster, England, greets children after celebrating Mass on 6 November at Holy Family Church in Gaza City. The cardinal said his pastoral visit reinforced the importance of Christian hope, especially for those living in very insecure circumstances.